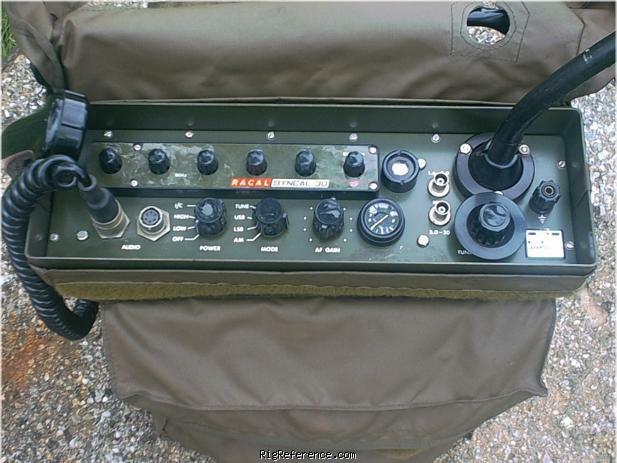 The Racal TRA-931 is a manpack HF transceiver. Frequency selection is done by way of 5 decade switches giving a 1 kHz resolution. A search knob allows further tuning within the 1 kHz range. The TRA-931 housing is made from industrial strength plastic and is water tight. The front panel has 2 connectors for mic/phones/keyer, AF-gain knob, mode-knob and small battery voltage indicator. A number of antennas can be connected to the TRA-931 which can be tuned with an internal antenna tuner (TRA-931A). For ham use 2 BNC connectors for 1.6-3 and 3-30 MHz are very suitable. i owen one and its a great rig, usb, lsb, am, cw..easy rig to work with, built in gold plated rollor tuner tunes from 1.6-29.999mhz. it has a built in swr meter for tunning, built in dehumidafier, about 11-LBS. w/o battery, i use to pc laptop batterys lithium light, you can run radio from 12-24vdc, 12v less output pwr, receiver good sensitivity, nice rit control good for cw with built in sidetone & delay, receives broadcast stations nice, lacking back light i guess to save pwr, you can switch from 5w or 20w, 2-inputs for 1.6 to 3mhz and 3 to 29.999mhz,2-inputs for headset and cw key, all in all the best all around radio for to money. they run forsale about $700-$1100 depending on etcs with it? from denny w7gg. hope this helps? Got mine in 2010, I have the battery case, handset, headphones and the whip. Radio can be carried on an Alice Pack with shelf which I have. Excellent receiver and transmitter. 20W from Singapore to Japan (whip)and US (end fed 5m wire acting as vertical with counterpoise). Macho Radio for Macho Ham. Estimating the value of a rig can be challenging. We collect prices paid by real hams over the years to help you estimate the current value of the Racal TRA-931. Just bought or sold this model? Let us know what you traded it for and help other ham operators!